Be WISE about your brain health! Dr. Arenander welcomes you to a healthy, happy brain! scroll down to the bottom of this page and click on the photo of the kit you are interested in. • Lowest prices you will ever find anywhere! • Free, quick shipping to the USA! • Detailed instructions and information about why each product is helpful. To watch a video describing each kit and the products within it, click below. Each kit builds upon the one before it, so to help decide which kit is best for you, watch each short video, in order. Video: On the superior quality of Omegas we offer in each kit. "What can I do for my brain?!" Countless friends and customers have shared with us stories of memory loss, brain fog, or just not feeling quite as sharp as they are used to. They always wonder, "What's wrong? Is there something I can take to help my brain? Can I get back my thinking and memory?" • Low prices and free shipping! The supplements in these kits are confirmed by modern research to be invaluable to improving and maintaining a healthy brain and body. 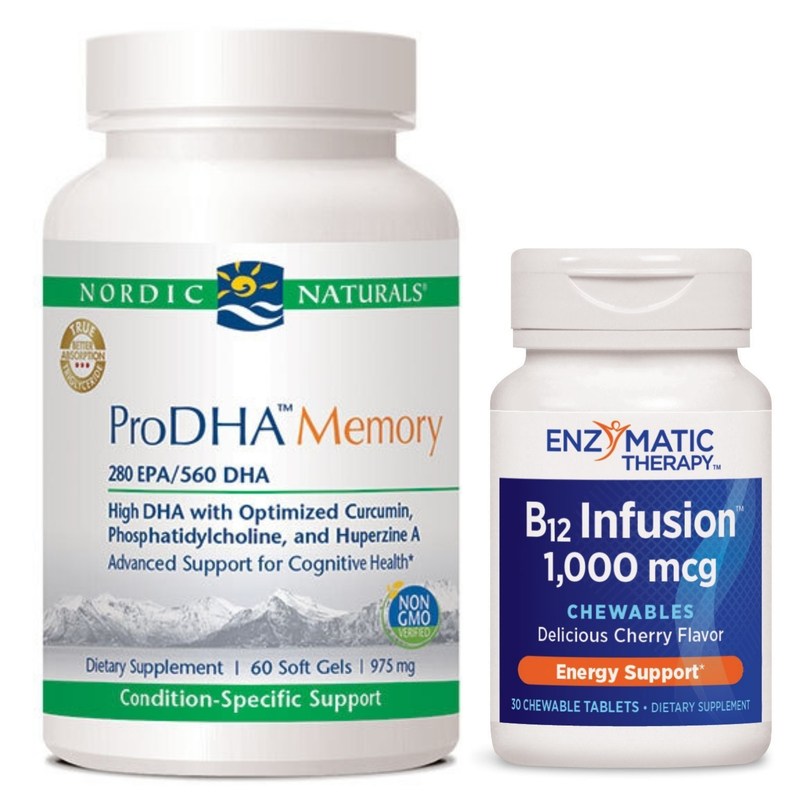 Formulated by a neuroscientist - Brain health is Dr. Arenander's expertise. These research-based kits are made up of the products we take ourselves, and the ones we chose after extensive research and experience with each. Your brain is very important! You have to give it what it needs to do its job. This is especially important as we age. Boost brain power and mental alertness. •Give your body and brain the nutrients it needs! •Reduce brain fog and memory loss. • Lowest price you will ever find! Each order contains everything you need for optimal brain health all month at a fantastic price. We price this low so more people can take advantage of the research-based selection of brain and body health supplements each month. We hope you love these kits as much as we do. 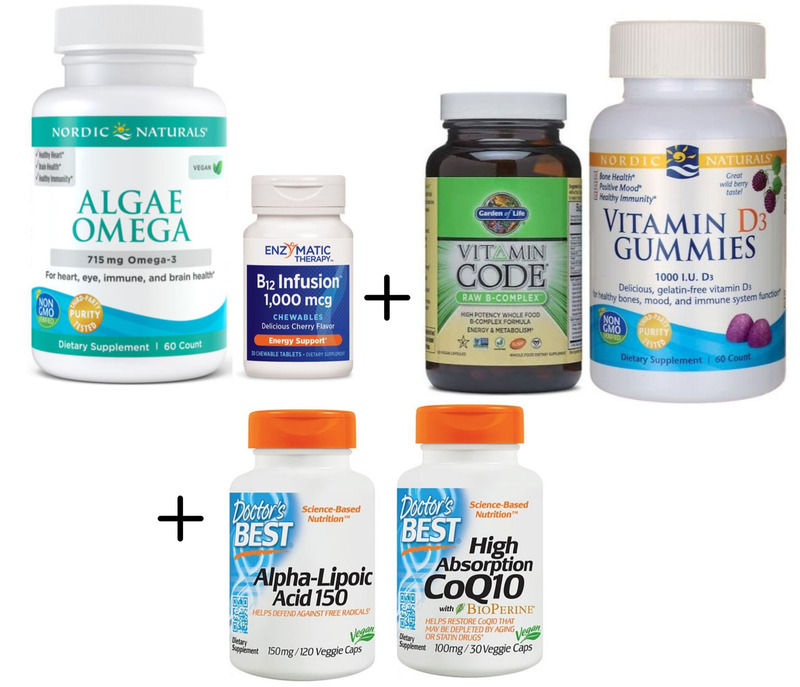 The only difference between the regular kit options and "veg" is the choice offered of fish- vs. algae-derived omegas. The choice is yours! Below is a brief description of each kit. Look for the summary to view it's vegetarian counterpart. Scroll further to browse and purchase any kit! Start here to help your brain and health on a small budget. 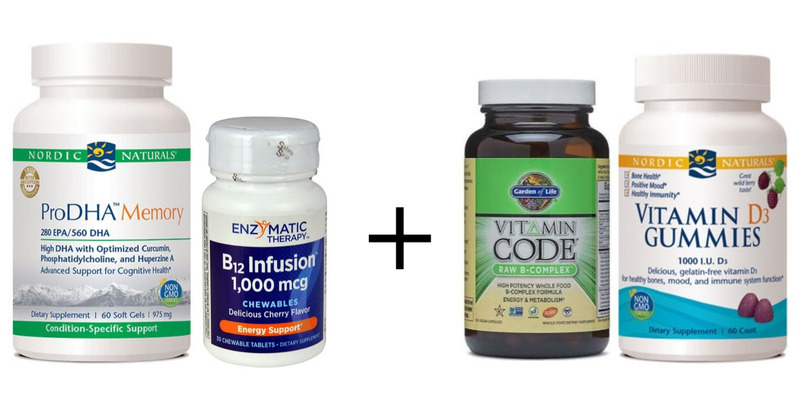 This kit contains two absolutely key supplements, essential for proper health, especially in the aging process. If you are a vegetarian, these can be considered essential since they are not easy to find in a veggie diet. Most people, especially vegetarians are VERY low in B12 and hence have VERY high, toxic levels of an otherwise OK cell pathway substance, homocysteine. This is not good for the brain or the heart or blood vessels etc. B12 is good for every cell and everyone. Decades of omega research shows clearly that supplementing with omegas at 500 to 2000 mg or more per day is beneficial from pregnancy across the lifespan to senior years. 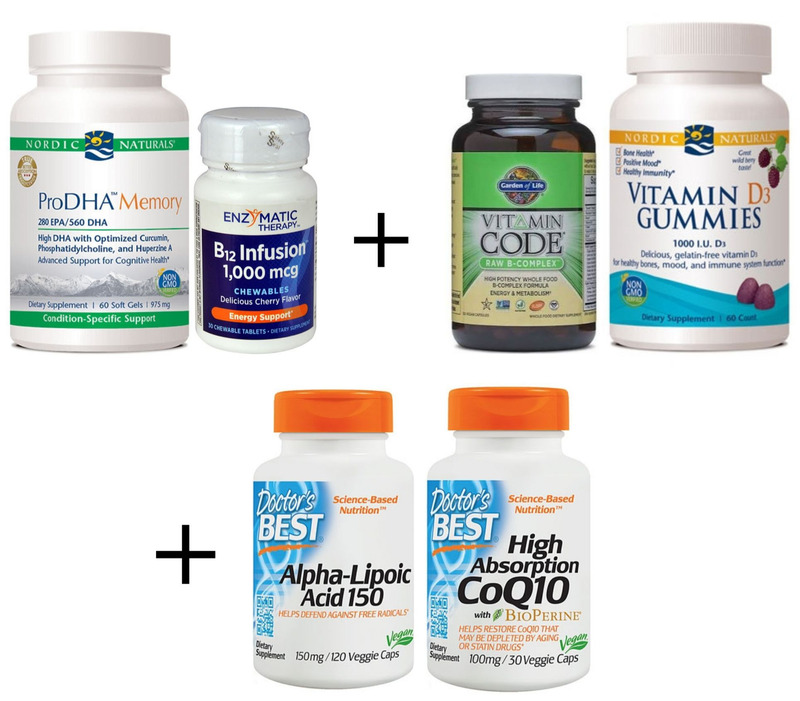 Good for brain, heart, skin, eyes; every cell membrane to function properly depends upon an optimal level of EPA and DHA. The modern western diet is not at all helpful in this regard, filling our bodies with overwhelming levels of pro-inflammatory omega 6s instead of the essential, anti-inflammatory omega 3s. 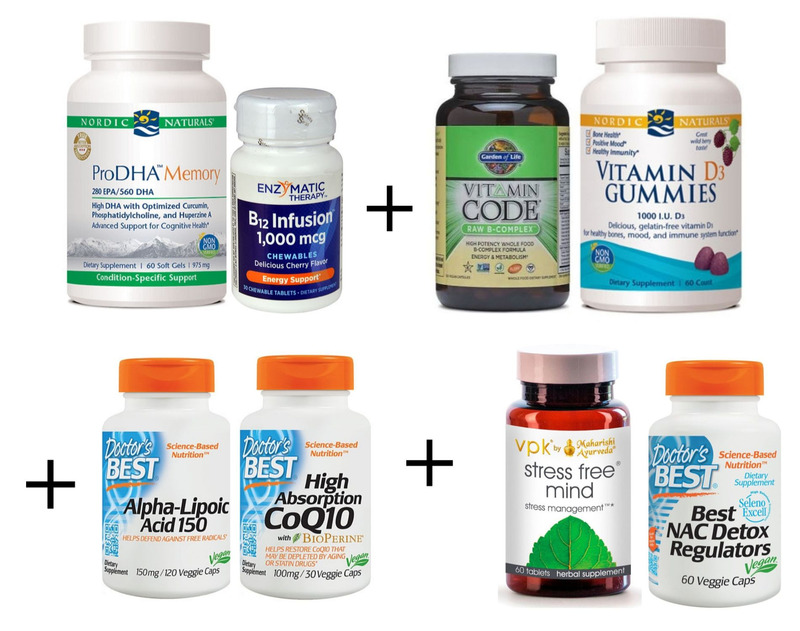 Our research leads us to choose this Nordic Naturals brand Omega 3s as the absolutely best quality and combination without any extra cost – in our Budget Brain Kit!! Click here for more information on each product in the Budget Brain Kit. Click here for the Veg Budget Kit. This kit includes everything in the Budget Kit PLUS … 2 more key vitamins: Full spectrum natural source B complex and Vitamin D3. The small increase in price is well worth it because both of these additions are highly significant. While B12 is essential, a full spectrum B formulation has been known for decades to be fundamental to good health and proper aging. This product is natural sources and not from chemicals. We offer Nordic Naturals vitamin D3. More and more research is showing that it benefits not just bones and skin, but nearly every aspect of cell physiology and healthy tissue integration. Yes, in young adults, daily sunlight exposure gives you good levels of D3. But, if you are behind a desk, in Northern climates or even just over 60, then the sun is not helping you much, or at all. So, less than a dollar a day helps you to be safe with daily D3. Click here for the Veg Basic Kit. This kit includes everything in the Basic Kit PLUS …. 2 key energy regulators for your brain, heart and whole body. For minimal extra cost, if you are over about 50, this one is for you. With increasing age, levels of these three substances are known to be significantly reduced leading to poor or dysfunctional energy production in your brain cells. Energy moves life: when our energy factories (cellular mitochondria) are not performing well, then we have less energy, less memory, less health. More specifically, Coenzyme Q10 (CoQ10) is a naturally occurring antioxidant that can help with dementia, liver disorders, oral health, cancer, headaches and cardiovascular health. A major cause of aging is the deterioration of the energy-producing components of the cell including Alpha Lipoic Acid (ALA) and CoQ10 above, which results in reduced cellular metabolic activity, the accumulation of cellular debris, and eventual death of the cell. L-carnitine helps to maintain cellular energy metabolism by assisting in the transport of fat through the cell membrane and into the mitochondria within the cell, where these fats are oxidized to produce the cellular energy ATP. With overall better energy supply, all your cells, and you, just work better! Click here for more information on each product in the Essentials Plus Kit. Click here for the Veg Essentials Plus Kit. For the happiest brain, we suggest this kit! In this kit, you get a bottle of the well-known MAPI brand Stress-Free Mind, a full spectrum of Ayurvedic herbs for a naturally settled and clear mind. Plus, you get a months supply of N-Acetyl Cysteine (NAC), a supplement documented to help with mood disorders, brain problems, respiratory oxidative problems, sleep disorders, infections, flu, diabetic insulin resistance, and conditions of oxidative stress, even cancer. Since a fundamental factor of poor health and aging is the level of inflammation, NAC has a profound role in increasing the master antioxidant glutathione in the body. By increasing the antioxidant supply, inflammation can be better controlled and thus help mood, cognition, energy and the aging process. Click here for more information on each product in the Premium Brain Kit. Click here for the Veg Premium Brain Kit. ProDHA Memory & B12. These Nordic Naturals Omegas are so pure that there is essentially no ‘fish’ left in the capsule. Most vegetarians are OK with taking this form of omegas. 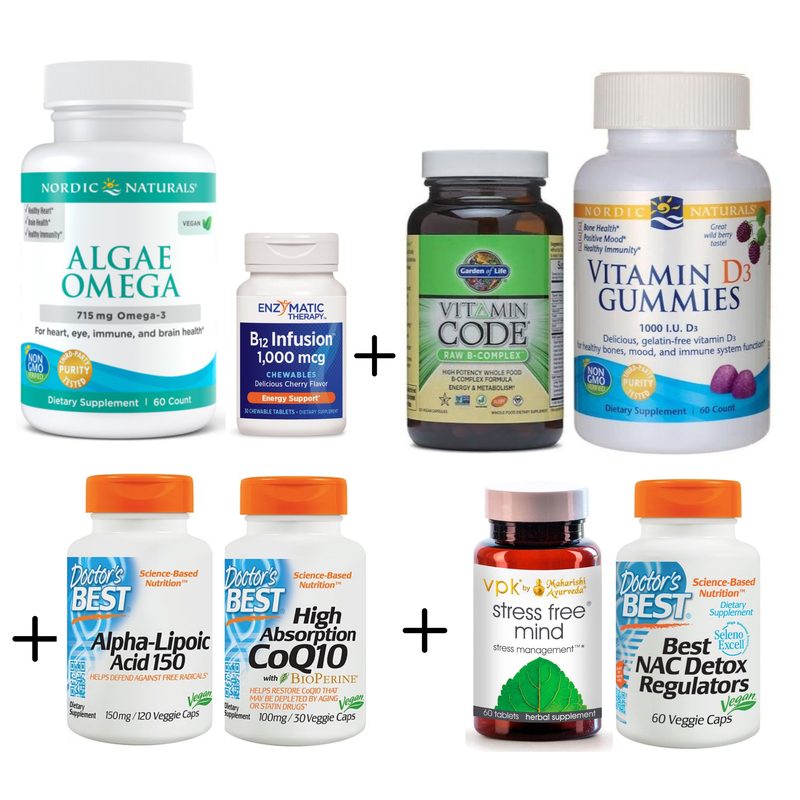 If you prefer algae omegas instead of fish, choose the kit below. 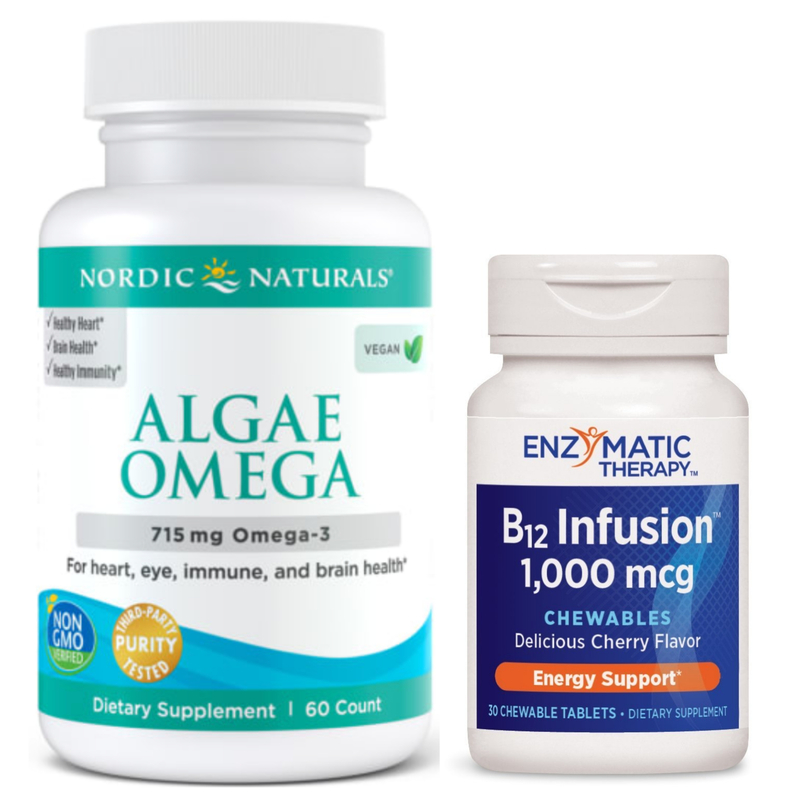 We offer this special Nordic Naturals algae-sourced choice of omegas. Finally, to purchase, or view detailed information on any kit and the items within it, scroll down and click on the photograph of the kit below. Legal Disclaimer: This website, products and educational videos do not provide any medical advice. Information on this website, instructional materials and video series is provided for informational purposes only and is not intended as a substitute for the advice provided by your physician or other healthcare professional or any information contained on or in any product label or packaging. You should not use the information on this website, instructional materials and video series for diagnosing or treating a health problem or disease, or prescribing any medication or other treatment. You should always speak with your physician or other healthcare professional before taking any medication or nutritional herbal for homeopathic supplement, or adopting any treatment for health problem. If you have or suspected to have a medical problem, probably contact your healthcare provider. Never disregard professional medical advice or delay in seeking professional advice because of something you have read or heard on this website, instructional materials and video series. Information provided on this website, instructional materials and video series and use of any products and services related to this website, instructional materials and video series does not create a doctor–patient relationship between you and the author or others affiliated with this website, instructional materials and video series information and statements regarding dietary supplements have not been evaluated by the food and drug administration and are not intended to diagnose, treat, cure, or prevent any disease.